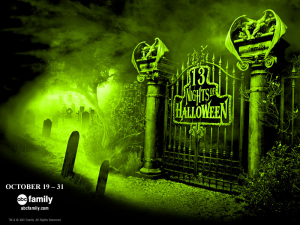 ABC Family scares up the ‘2015 13 NIGHTS OF HALLOWEEN’ celebration, with programming filled with scares and frights as you countdown to Halloween. The popular programming event, now in its 17th year, kicks off on Monday, October 19th and concludes on Saturday, October 31st, and features a special Halloween episode of procedural drama “Stitchers.” The stunt will also include the ABC Family premiere of Johnny Depp in “Sleepy Hollow,” the network premiere of “Disney·Pixar’s Monsters University,” and a delightfully scary mix of Halloween-themed programming airing for the 13 nights leading up to Halloween. 11:00pm – Disney·Pixar’s Toy Story OF TERROR! 6:30pm – Disney·Pixar’s Toy Story OF TERROR! 9:00pm – Disney·Pixar’s Toy Story OF TERROR! So what does everyone think? With the exception of Beetlejuice’s removal and Hocus Pocus getting A LOT more air time this year- it looks pretty similar to last years schedule.